You might have read or came across many books during your study at the Nursing school, but the need for that one guide which helps you revise and retain all that you need for NCLEX, as well helps you practice questions can not be eliminated even in the presence of hefty course books! Of course review guides are many and choosing the right one can be tough! If you’re one of those who need a full fledged review course, to re build confidence in yourself, revive your knowledge and enhance your skills you may check this one. Be it any review course or book, first of all you need to understand this before buying anyone of them. They are centred around three main areas and you need to decide what is it that you need? NCLEX review that focuses on good CONTENT: Such books provide you with concrete NCLEX oriented content, not cutting it short in any way, instead they aim to make it easier for you to understand it as well as memorise it. They help to build your foundation for taking the NCLEX exam. Strategy oriented Reviews: The NCLEX questions are indirect, twisted and tricky. So many books like Prioritisation, Delegation and assignment by LaCharity do not focus on providing you extensive content but they take care to provide you strategies and tips to develop analytical and clinical judgement skills to help you handle the questions. Reviews providing extensive practice of Q/A: Many assume that practice is the key to success, they aim at providing you zillions of NCLEX style questions such that you practice them and hence revise your concepts and build a good understanding. such question banks are also available. Students needs differ and so do their choices. Some NCLEX takers are working people short of time, some are still students, some have good knowledge of content, and some need to brush everything up since it has been long since they passed out from the nursing school, while others a stuck with poor understanding and unfolding of the NCLEX questions. So, it is only you who can make the right choice and we can only guide you. Are you still a student or have passed long back from the nursing school? Do you retain enough of what you had learnt? Decide on how much time you can spend on studying. Bottomline: Highly recommended for students for starting their preparation for the NCLEX and are in search for a robust guide that provides that will make them well grounded with content as well as practice questions! It is a well acclaimed book for NCLEX RN preparation which has been authored by renowned nursing educators. This has been consistently the best selling NCLEX book. A balanced blend of good content and and NCLEX style questions is what they have to offer. Those who have used the book report that Lippincott’s review book is more closer to the NCLEX with respect to the questions and content that it offers. Content focuses on four major areas in pre-licensure programs: obstetrics, pediatrics, medical-surgical, and mental health nursing. Lippincott’s NCLEX-RN 10,000 in association with PrepU, which is a computerised adaptive learning system is also an option for students who need to practice for the real exam, in the best manner. Provides lots of study tips and a ‘self analysis grid’ to track your progress. Bottomline: A good review guide which can be your real aid to push you through in your NCLEX exam. This one is also an NCLEX review guide, but isn’t content heavy. Well, it is unique in its own way and does the job quite well. La Charity’s book ‘Prioritisation, Delegation and Assignment’ provides the concise yet complete content but focuses more on the most important skills of Prioritisation, Delegation and Assignment that you need to answer critical questions in the NCLEX exam. The book has been authored with the aim of making you revise the essential facts and make your base stronger in your nursing content, as well as train you to apply the learnt knowledge. A nurse’s task revolves around prioritising, delegating and assigning tasks that are crucial to a patient’s health and well being and thus the NCLEX tests this skill too. This book is loved by most students its unique method of training the mind for the practical application of what you learn in a nursing school. Provides concise and consolidated knowledge of nursing content. Neither too extensive or lengthy with the syllabus, that it might not bore you off. The practice exercises are placed in ascending order of difficulty. The new edition contains addtional 60 pages of questions. Answer keys with detailed rationales are given. Most of the questions in this book are more difficult than those asked in the NCLEX, they are useful enough to train a mind for the real exam and align your thinking like it should be to get the answer right. Bottomline: It is an indispensible resource for those who need to build the clinical thinking and decision making skills along with revising their content well. The HESI book is a content book that coves all the nursing topics in a manner that is easy to read and memorise. Health Education Systems Incorporated (HESI) is a United States company that provides exams and other study material to help prepare student nurses for their professional licensure exam. Schools often use HESI to help predict the students likelihood of success in tests such as the NCLEX-RN. So, this one can provide you exactly what you must be studying. The book’s special feature is that, it’s content is to the point. They do not elongate any topic of study and focus on gain of relevant and apt knowledge. It is targeted for HESI and NCLEX both. Not many tips, tactics or test taking strategy is focussed on, in this book. This book’s companion website Evolve, offers practice questions too.This book is content oriented but it is neither too comprehensive nor concise, it provides very manageable text that is easy to understand and revise, while covering the entire syllabus. Covers the entire nursing syllabus keeping in view the latest changes. Synchronised chapter organisation makes it easy for students to revise the syllabus. It is content oriented so does not focus much on strategy. Also provides some fill in the blanks and prioritising questions fro practice. The companion website evolve offers around 600 questions for practice. Bottomline: This book is well known for its concrete and to the point content. It is recommended for students who are weak in content and need to revise well to build a strong foundation. Mosby’s Comprehensive Review is known for concise content and simple language, which leads to easy understanding. The book comes in two versions; one for the NCLEX RN and the other for NCLEX PN. The nursing content is well updated, put forward systematically with highlighted facts that are crucial to learn and remember. Each chapter is followed by a practice test, that focuses on building the ability to apply the learnt knowledge and decision making. The NCLEX RN review book focuses on medical-surgical, pediatric, maternity/women’s health, and mental health nursing areas. While the NCLEX PN review book takes care of cognitive level, phase of the nursing process, client need, with increasing level of difficulty. The questions serve as a medium to identify strong and weak areas to further help the students to re strategise their studies. Updated, concise and relevant content. The content is arranged and put forward in a lucid as well as an impressive manner. Each chapter has a practice exercise of NCLEX style questions. In depth explanations are provided for correct as well as in correct answers. The book comes along with a companion CD allows students to create customized quizzes and exams. The questions provided in the book as well as the CD together are over 4200 for the NCLEX RN and around 3500 for the NCLEX PN. Nursing management section has especially been included in the new edition. Delegation and leadership areas have also been dealt with separately. This review guide has long been serving the students with updated knowledge to cross the NCLEX exam. This book is really simple in its approach and does not provide many tactics or strategy. You will have to build your own strategy while this can be an aid in helping you to brush up your knowledge. Bottomline: It is a well trusted book and has been there since long. It can be used to supplement your study in the nursing school or revise essential elements before you appear for the NCLEX exam. But for any special strategy or tactics related to handling crucial NCLEX questions it may not be the best one. Nurses are an important part of the health care team as they play a major role in the rehabilitation of patients. In most cases they are the ones providing most of the direct care that is given to patients. The duties that are conducted by a nurse heavily depend on the position that they hold.If we look at the broad categories, we have two types of nurses Registered Nurses (RN) and Practical Nurses (PN) in the USA. Apart from this, we also categorise nurses based on their area of work or where their duties are assigned. Whether you undertake an accredited nursing program at a nursing school or online, you will also be required to complete clinical internships that provide you with the practical skills to become a good nurse. As a fully qualified RN, you will be able to work in a hospital or health clinic while completing your more advanced nursing education. The responsibilities of a nurse at core are the same, but have slight limitations fro an LPN. hence there are little differences in their roles. An RN has to know the requirements of the patients under their care. In most hospitals the nurses are also expected to accompany the doctors in the ward rounds. If there are changes with the patient, then the doctor is updated, these include discussing developments that have taken place since the patient was put under their care. To sum up their role we can say that apart from what has been mentioned above, patient care also includes supervision of rehabilitation procedures and therapies. Nurses must at all times ensure that patients are in the best comfort possible within the confines of the hospital and also to assist patients access specialized health care like counselling should the patient request such help. When it comes to patients, due diligence must observed to avoid lawsuits that can arise from negligent actions of the service providers. In the disbursement of their duties, the nurses also ensure that drug therapy is administered to the patients. This may include patiently explaining to the patient what they are doing and why they are doing it. Related to these duties is the collection of accurate data from patients and in the event that a nurse has just been allocated a new patient, such a nurse should take time to study the file presented to them. This allows for optimal delivery of services. They also coordinate the running of most hospitals by forwarding and receiving laboratory results that had been ordered. They also coordinate tasks of the various doctors in the health facilities and enforce some of their decisions or recommendations. They also delegate tasks to their assistants and orderlies. The nurses thereby take part in the administration of the facility. Administrative services taking care of the inventory, ensuring machines like the MRIs under their department are working, ensuring that high standards of cleanliness are maintained as well as to keep records of drugs that are used in the hospital with the help of the pharmacists. Being a qualified practitioner, one is required to be competent in delivering excellent health care to patients of all ages. In order to perform the daily tasks successfully, learning new knowledge and techniques is essential in today’s fast changing world. What exactly do licensed practical nurses do and where can they work? As a nurse, those are usually the questions that you may be asked by some people. Because the LPN’s roles are unique, answering such questions can be a bit tough. So here are some of the answers you might be looking for. A licensed practical nurse is also called a license vocational nurse and a registered practical nurse. The names may vary depending on the state or country you are in. Generally, license practical nurses are those who have undergone training and have obtained a license that allows them to provide routine care to the sick.LPNs report to a registered nurse or a physician. They work under their supervision. LPNs are also tasked to oversee and supervise nursing assistants in some medical facilities. They also help in extending help and perform comforting functions like bathing the patient, helping to reposition them in bed. Often the LPN will help the patient to dress or eat, even helping the patient to stand or walk. RNs have a longer educational curriculum and program. So, have a much wider knowledge on pharmacology, pathophysiology, management, legal issues, ethical practices and leadership. An LPN’s role in the medical facility depends on the state or country where he or she is working in. In some states, such as Texas, licensed practical nurses have a wide range of roles, making their tasks almost the same as the registered nurses’. They can initiate IV starts, administer medications with an IV push, as well as maintain central lines. There are other states though, like New York, that gives more limits to the LPNs’ roles. 5. Finger stick blood sugar testing. 6. Ostomy site care and maintenance. While there may be differences between licensed practical nurses and registered nurses, they also have their own similarities. Whether you are an LPN or an RN, it is essential to remember that despite the different labels, both nurses have to work together for the benefit of the patients and the facilities you are working in. EDITOR’s NOTE: Opt for the best review course for NCLEX that will bring together both theoretical and practical aspects of nursing so that you not only pass the NCLEX but also excel in your professional life! Pharmacology is the study of action of drugs. This study involves knowledge from various subjects on pharmacology to make a nurse understand how drugs work, their intended effects, and also help them to anticipate and recognise potential side effects. So, of course you know that this is a vital part of your Nursing content and crucial for your unerring profession! A nurse is the person who is closest to the patient, and can easily monitor his/her condition before and after the administration of drugs. Thus, having an in depth and sound knowledge about medications and their expected responses is indispensable for you. The licensure examination ‘NCLEX’ very well understands this and devotes at least 13 to 19% of the ‘physical integrity’ section to this subject. Who can understand better than nursing student himself that pharmacology can be really tough if you do not learn it with the right approach. Only cramming does not help, coz you are bound to mix the information as well as sometimes forget what you had learnt. Go through essential things that you must know in this course. You might be knowing that drugs are classified on the basis of how they affect the body like bronchodilators , laxatives, or by their therapeutic use like antihypertensives, diuretics, antipyretics or by some chemical characteristics like beta blockers. Classification for adult clients in a clinical setting! Anti-infectives: Used for the treatment of infections. Common side effects include GI upset. Antihypertensives: Lower blood pressure and increase blood flow to the myocardium. Common side effects include orthostatic hypotension. Other side effects are specific to types of antihypertensive prescribed. Antidiarrheals: Decrease gastric motility and reduce water content in the intestinal tract. Side effects include bloating and gas. Diuretics: Decrease water and sodium absorption from the loop of Henle (loop diuretics) or inhibit antidiuretic hormone (potassium-sparing diuretics). Side effects of non–potassium-sparing diuretics include hypokalemia. Antacids: Reduce hydrochloric acid in the stomach. A common side effect of calcium-and aluminum-based antacids is constipation. Magnesium-based antacids frequently cause diarrhea. Antihistamines: Block the release of histamine in allergic reactions. Common side effects of antihistamines are dry mouth, drowsiness, and sedation. Bronchodilators: Dilate large air passages and are commonly prescribed for clients with asthma and chronic obstructive lung disease. A common side effect of these is tachycardia. Laxatives: Promote the passage of stool. Types of laxatives include stool softeners, cathartics, fiber, lubricants, and stimulants. Anticoagulants: Prevent clot formation by decreasing vitamin K levels and blocking the clotting chain or by preventing platelet aggregation. Antianemics: Increase factors necessary for red blood cell production. Examples of antianemics include B12, iron, and Epogen (erythropoetin). Narcotics/analgesics: Relieve moderate to severe pain. Medications in this cate- gory include opioids (morphine and codeine), synthetic opioids (meperidine), and NSAIDs (ketorolac). Anticonvulsants: Used for the management of seizure disorder and the treatment of bipolar disorder. Medications used as anticonvulsants include phenobarbital, phenytoin (Dilantin), and lorazepam (Ativan). Anticholinergics: Cause the mucous membranes to become dry; therefore, oral secretions are decreased. Anticholinergics such as atropine are often administered preoperatively. Mydriatics: Dilate the pupils. Mydriatics are used in the treatment of clients with cataracts. Miotics: Constrict the pupil. Miotics such as pilocarpine HCl are used in the treatment of clients with glaucoma. The nurse is expected to use the seven rights when administering medications to the client. These include five rights of drug administration, plus two from the Patient’s Bill of Rights. Right client: Identification of the client must be done by asking the client to state his name and checking the identification band. Right route: The physician orders the prescribed route of administration. Right drug: Checking both the generic and trade names with the physician’s order ensures that the right drug is administered. If the client’s diagnosis does not match the drug category, the nurse should further investigate the ordered medication. Right amount: The nurse is expected to know common dosages for both adults and children. Right time: The nurse can administer the medication either 30 minutes before the assigned time or 30 minutes after. Right documentation (from the Patient’s Bill of Rights and legality issues in nursing): This right is different from the others in that it must be done to prevent duplicating drug administration. Right to refuse treatment (from the Patient’s Bill of Rights): The client has the right to refuse medication or treatment. This involves collection of data of patients that include laboratory and diagnostic tests to analyse teh patient’s health and recovery rate. Nurses are responsible for administering as well monitoring the theraputitic and unknown effects. Knowing the complete medical history and regular assesment helps in proper medical care. NOTE: Find more knowledge about Pharmacology for NCLEX and the relevant study material to crack the licensure exam and kick start your career! The course is intense. It is a comprehensive subject and so it may intimidate you in the first instance. So, you must devise some strategy to handle it! Segregate the important from the less important stuff: It is not necessary to learn all the stuff even you do try to cram it all you are bound to forget some portion of it or get confused in your mind while recalling. It is better that you learn the more important portions and be at ease. How to identify what’s essential? Go through the NCLEX exam apttern and make choices. Devise your own learning style: Everyone learns in a differnt style, let yourself understand the syllabus and read it thouroughly and find out what is the best method for you to learn this content. Drug names can be really confusing. It is better that you learn the classification first and then learn prefixes as well as suffixes to remember the drugs with similar mode of action and effect. Take help of Mnemonics: You can creatively make your own mnemonics to learn extensive drug categories, names etc. It will ease memorisation. Learn with friends: The best way to learn something that’s difficult is to teach others or collective learning. Make a study circle where you can learn along with others. Concentrate well, call out aloud with friends to cram things better. Take help: You can take help from teachers in your school or from guides too. But what we recommend is to be really NCLEX specific while learning, so that it gives you maximum benefit. Nurses do not prescribe drugs, they are involved in monitoring and analysis of the patient’s condition so too much knowldeg is not required like a medical student may need. It is better for you to go in for a good NCLEX review course that may ease this portion as well as others pertaining to the nursing content and help you cross the NCLEX! It is the duty of the nurses to keep track of the administered drugs. The tasks need to be done with expertise because a small mistake can be detrimental to victims. Therefore nurses must have solid understanding on drugs so that the nurse can perform the job proficiently.Pharmacology classes teach how drugs act in a human system and on how medication is classified. Many subjects are touched in these training including different physiological systems and the effect of drugs on them. In addition, there is an emphasis on terminology and vocabulary of medications. Pharmacology for nurses entails a lot of information being absorbed. A nurse with this course is able to understand the internal and external effect of medications and can recognize symptoms of adverse effects or an overdose. Since, this is an important as well as tough portion of the nursing content, if you can’t handle it yourself find the right support and guidance to help you through. Maslow’s Hierarchy of Needs: How does it find relevance in nursing? The nusring profession is a challenging one! Nurses often face complicated situations where they have to take decisions and sometimes address multiple issues at a time. Their job is not limited to providing help that heals a patient physically but sometimes they also have to pacify the perturbed minds of the patients as well as their families. When you have lots of jobs at hand, how should you be handling them? The answer in in setting priorities and accomplishing the most important first and so on and so forth. Now, the question arises as to how a nurse should be setting priorities? Maslow’s Hierarchy of Needs, lays down the human needs in manner where it becomes easy to understand what should come first and what last! Psychologist Abraham Maslow defined basic human needs as a hierarchy showing how human needs progress from the most basic needs to complex ones! 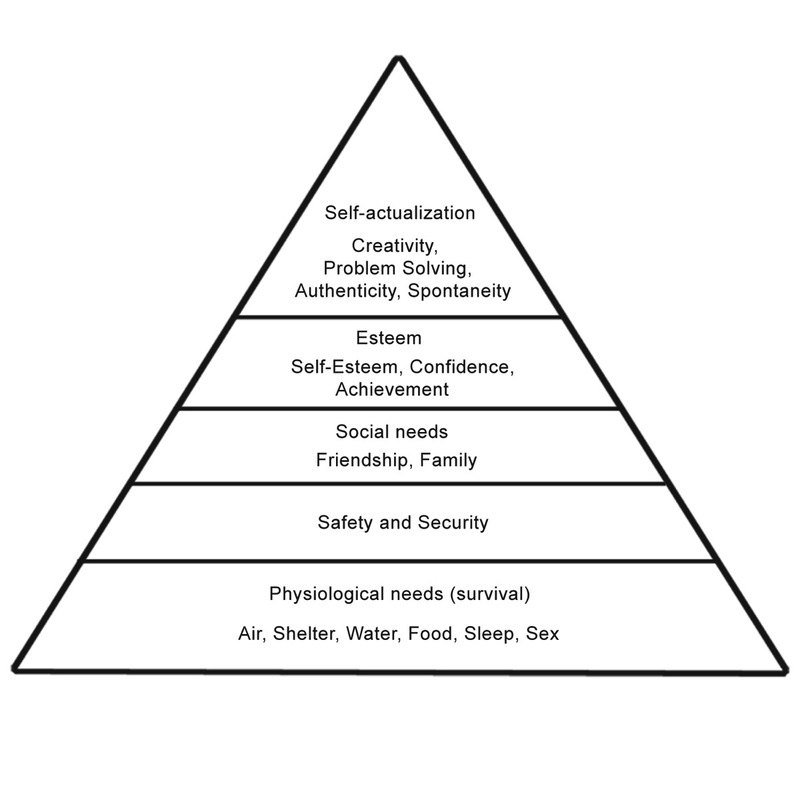 The Maslow’s Hierarchy of needs is depicted in the form of a pyramid as given below where he has shown the base of the pyramid holds the most important and crucial needs of physiological well being which require food, air, water, sleep etc. Progressing upwards in the pyramid, the degree of importance of the needs keeps decreasing. After the physiological need we have needs for safety and security which include shelter. Henceforth are social needs, esteem needs and self actualisation needs. A need is defined as that which, in its absence breeds illness, when present prevents illness and if restored, cures illness. Maslow also felt that the need is inactive, at a low ebb, or functionally absent in a healthy person. But, needs exist in a hierarchy and so when one need is satisfied the person becomes aware of another need. For example, the basic physiological needs have a greater priority over those higher on the pyramid. They must be met before the person can move on to higher level needs. In other words, a person who is starving will not be concentrating on building his self-esteem. A patient in severe pain will not be concerned with improving his interpersonal relationships. Why is Maslow’s hierarchy of needs important in nursing? With the perspective of the nursing profession nurses and clinical care that is extended to patients, Maslow’s theory holds great importance. It helps nurses to prioritise client’s needs. Whenever they will face a situation that demands them to prioritise they will easily be able to decide that physiological needs hold the most importance and need to be fulfilled first, then the others may be taken care of. A research paper published by NCBI: Improving Patient Care Through the Prism of Psychology: application of Maslow’s Hierarchy to Sedation, Delirium and Early Mobility in the ICU establishes the importance of this theory in the Nursing Profession. With respect to client care let’s see what the needs are and what any efficient nurse can to render the right kind of help! 1. PHYSIOLOGICAL NEEDS: They include basic concerns by family members if sometimes patients are unaware of their condition. This is mostly extended and well taken care of by hospitals. It may include providing support for failing organs, pain and symptom management, taking care of nutrition etc. 2. SAFETY NEEDS: Concerns about emotional well-being in the context of frequent nightmares and delusions as well as with whether the ICU team can prevent their conditions from worsening. This can be taken care of by preventing errors, delirium management and monitoring, taking care of hospital acquired infections etc. 3. SOCIAL NEEDS (LOVE/BELONGING): Concerns about how much support they will receive if their critical illness persists (e.g. will people continue to visit or will they forget about me) and well as whether they will “fit in” to old communities now that they have “newly acquired” disabilities that may limit them.Hospitals should allow open visitation of family and friends and post ICU support should be given by nurses. 4. ESTEEM NEEDS: Concerns about whether they can reach recovery-related goals – e.g. return to vigorous activities or to work as soon as they had hope.Can be fulfilled by recognition of dignity/value in each patient, optimising pre illness cognition and physical function through rehabilitation. 5. SELF ACTUALISATION: Concerns about ability to reconcile pre-morbid identity with “new normal” and to embrace a potentially new identity.For re establishing this need, incorporation of spiritual values into patient acre, acceptance of new limitations, reconciliation of new identity etc can be of some help. It has been affirmed that especially for patients who have long been in the ICU, ‘aftercare’ is very important. Maslow’s Hierarchy of Needs, provides the framework and spark that are needed to enhance translation of care with a patient-centered emphasis on the physical and psychological complaints experienced by survivors. The poor quality of survivorship and dismantled lives of many patients emerging from ICU care remain an under-recognized public health problem that is not being addressed rapidly. For nurses working in ICUs this theory lays down relevant guidelines which help them to work efficiently while even understanding their patient’s need well! Since the prime duty of any nurse is ‘Client Care’! Nurses will also be able to adjust their behaviour towards patients when they understand their needs well. They can develop a good bond with them leading to an amicable environment and speedy recovery. Apart from the practical aspect, when it comes to the Licensure examination, the NCLEX this will also be of great help. Having correct knowledge about this will help you understand needs and answer tricky NCLEX questions that require you to prioritise and take decisions! ‘It is strategy, that lies at the core of winning any battle!’.………..By mastering how to take the test, you’ll improve your chances of getting high marks, minimize test taking errors and have a lifeline once the questions start to sound like gibberish. Find out what it needs to obtain flawless quick results in NCLEX! The National Council of State Boards of Nursing deliberately made the NCLEX more adept at selecting test takers who are not only knowledgeable but are skillful as well. In simple terms, the NCLEX exam is difficult. Even when you’ve studied enough during your NCLEX exam review, you could still end-up lost and confused during the exam. Here, comes in the need for a Well Grounded Strategy.NCLEX-RN and PN exams can be passed only with the right orientation and preparation. Of course it is a tough battle, for which you will need support and guidance. Cramming the whole nursing syllabus is of course a hefty task, but still it won’t be enough for you to crack this exam since it has been designed to test a lot more than your retaining power! EDITOR’S NOTE: If you’re looking for a review course that provides all; a good study plan, robust strategy, NCLEX targeted content, and rigorous practice of questions. You may choose Brilliant Nurse and relieve your pressure while getting unparalleled support as well as guidance from expert faculty. Check out the given links. Extended (3 month access) NCLEX-RNÆ Test Prep Track and Extended (3 month access) NCLEX-PNÆ Test Prep Track. To get through in your first attempt, plan well. Go, through the key elements that are intrinsic to a good TEST TAKING STRATEGY! 1. Understand test format and the demand of the exam: Familiarising yourself with the test format in question is the first step to exam preparation. The National Council of State Boards of Nursing review the nursing requirements every three to four years, by conducting a job analysis. The NCLEX exam is then upgraded and redesigned to incorporate new topics, including new developments and upcoming requirements for better nursing staff. The questions are designed in a manner that they filter out adept and skilful, nurses and not only knowledgeable ones. The questions of course are tricky and difficult. Moreover the level of of difficulty increases as you keep answering them correctly, with every next upcoming question. The NCLEX uses Computerised Adaptive Testing (CAT) where you get around 30 seconds to answer a question, which can build pressure on the test taker. One of the most imp thing is that this exam focuses on testing your critical thinking ability, your analysing and decision making power. So, it often happens that a bright student of the nursing school may fail the exam. To get through this one, you need sound theoretical knowledge but alongside be skilled at how it will be applied in real situations! 2. Get mentally prepared: How do you get mentally prepared? Even before that, as a pre requisite to making up your mind for the NCLEX, you need to know well about the test itself! What is the pattern of the test? The syllabus? The style of questions? The hurdles that people face? Why have people failed? What is it that you dread or your weak area? A good analysis of all the stuff will help you prepare yourself mentally to beginning your preparation with the right approach, convince yourself for the much needed hard work and get through in your first attempt! 3. Know your content: Nursing content is lengthy and tough. It is of course an uphill task to remember it all! First of all you need content based on the updated syllabus keeping view of the present requirements. The content should be organised and NCLEX oriented. A good review provider will cut down the irrelevant part of your nursing syllabus and focus more on the important areas. Moreover it should be studied in new and innovative ways, covering a wide array of topics, to keep you adept and updated with the most needed information on various facets of nursing that you have no chance to regret later. 4. Master the NCLEX questions: NCLEX, comprises of a wide array of questions. It tests your all round abilities. There is no single approach to answering such a variety of questions. You should try to analyse all types of questions and practice them enough develop the clinical reasoning and critical thinking skills that you need. Each new question will help you revise some important fact and will help to develop your thinking in a way that you can apply your learnt knowledge! 5. CAT (Computer Adaptive Testing): The “adaptive” in CAT implies that the exam is not simply a static one. It’s not that you sit down and answer a set of predetermined questions but instead the exam will constantly be adapting to your answering style.As you’re taking the exam, you will be given a question that is of medium difficulty. If you get the question correct, the following question will be more difficult. If you get this question correct, the following question will be even more difficult.As you are going through the exam, every answer you get correct will cause you to receive a more difficult question afterwards. However, if you get a question incorrect, then the following question will be slightly easier. And so this assumes that as you go through the exam getting some questions correct, some questions incorrect, the test will constantly adapt to your testing style so that you are given questions that are fair to you and that you have the relative ability to answer. Get a good practice of NCLEX styles tests, that simulate the real test. Many trusted NCLEX review courses provide this facility. 6. Devise a study schedule: A good study plan comprises of a balanced distribution of your entire syllabus according to the number of days you have dedicated for your preparation. Systematically target yourself to revising your content alongside practising the NCLEX style questions. Be regular in following your scheduel and do not forget to alott some time for revision. 6. Minimise Errors To Maximize Your Scores: As was published in the Journal of the National Medical Association, students who have received instructions on test taking strategies had significantly higher test scores than those who didn’t. This means that test taking strategies can indeed improve your test accuracy and get higher scores. Strategise and train yourself before you enter the examination hall. What to do during the test? Read the instructions carefully. This is often overlooked by many NCLEX test takers, especially by those who are either excited or anxious to take the exam. Read the question and look for the stem. The stem is the core of the question and will serve as the basis for your answer. Decide what type of information the question requires. Check if you should prioritize, delegate, assess or intervene. Read through the choices and see which ones fits the stem correctly or grammatically. Grammatically correct choices are usually the correct answers. Check each choice for the presence of general words like always, all, complete or total. These choices are 98% wrong. So if you have doubts, eliminate choices with these words immediately. Cross-out wrong choices. This increases the probability of choosing the right answer. Answer the question. Based on what you’ve learned during your NCLEX review, answer the question. Finally, if you don’t remember anything about the questions or the choices. Judiciously choose from the choices that you haven’t eliminated. “You need to be disciplined and really good at implementing all of this to reap the real benefits. If you feel that you need support check out for the best Review Course that will help you in all aspects!” We recommend BRILLIANT NURSE NCLEX REVIEW. Why should you opt for this review program? UNFOLDING CASE STUDY :- Ruth Marie is a 68-year-old White female. While shopping at the mall with her daughter, she saw a health fair being advertised; it had healthy snacks available and free blood pressure (BP) screening. The nurse took her BP and told her that it was 164/96 mmHg. This was the first time Ruth Marie was told that her BP was elevated. Obesity—YES; this increases the risk of primary HTN. Alcohol consumption—YES; this increases the risk of primary HTN. Sodium retention—YES; this increases the risk of primary HTN. 2. A few weeks later, Ruth Marie went to her primary care provider (PCP) and had her BP taken again. She was diagnosed with HTN and prescribed an angiotensin-converting enzyme (ACE) inhibitor and a thiazide diuretic. She was also placed on the DASH (Dietary Approaches to Stop Hypertension) diet. Which statement made by Ruth Marie indicates an understanding of the low-sodium diet? “I will begin eating cooked cereal for breakfast.”—YES; cooked cereal is low in sodium. Case studies that mimic real scenarios, help students to develop better decision making abilities and learn how to answer them by correctly interpreting them. Before, deciding on which course to take, you need to remember that knowing your nursing content and learning the clinical skills in a nursing school is not enough to pass the NCLEX exam. What you need more, is to be good at critical thinking! Knowledge at both ends, practical as well as theoretical, and its sound application will lead you to cracking the NCLEX in the fisrt attempt. Have a look at how they have categorised the variety of questions asked in the NCLEX exam and how you need to handle them: Their Strategy! Bottomline: Briliant Nurse is one such program that will guide you with the right study material, assitance, needed practice and APPROACH to handle questions to crack the NCLEX-RN and NCLEX-PN exams.